Aaron is a full-service Denton TX Realtor. He’s an experienced Denton TX listing agent, and he also offers professional buyer representation throughout the Denton market. Aaron has been helping individuals and families buy, sell and rent Texas homes for over 18 years. With with a data-driven approach and continuous market analysis, he provides regular market insights to home buyers and sellers. Aaron is committed to outstanding service during and after the sale. Currently residing in Denton County Texas, Aaron provides real estate services for home buyers as well as low cost listing services for Denton TX home sales. As a student of the market, Aaron strives to stay abreast of current trends and factors affecting the local real estate market. Aaron utilizes a formal education in business and finance with years of experience selling Texas real estate to help buyers and sellers navigate a dynamic housing market. Aaron is also a TEA certified educator in the state of Texas. Aaron is not your typical Denton Texas Realtor because he’s more than just a salesman. 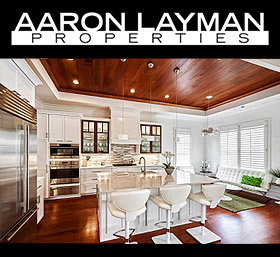 Aaron Layman Properties is an independent real estate broker, free from the constraints of any large volume-driven listing mills or other franchise real estate companies that place profits ahead of people. Aaron understands that real estate is a people business, and when you put people first good things will happen. If you are looking for a Denton TX Realtor to help you with your next relocation, Aaron Layman Properties welcomes the opportunity to serve you. To get started buying a home in the DFW Metroplex, check out the DFW Metroplex Real Estate Guide on this site. For sellers, a great way to get started is with a free market analysis and valuation of your home or property.